Today is the kickoff for the Make It, Take It! Blog Hop for my friend Krista's book. If you head over to Krista's blog, Poppyprint, you can read all about the book, see Krista's projects, and enter the her draw for an electronic copy of the book. Krista has done just the best job with this book. It was so easy and fun to work with her and it is just so thrilling to be a part of this talented group of contributors. I sure hope you love it as much as I do! 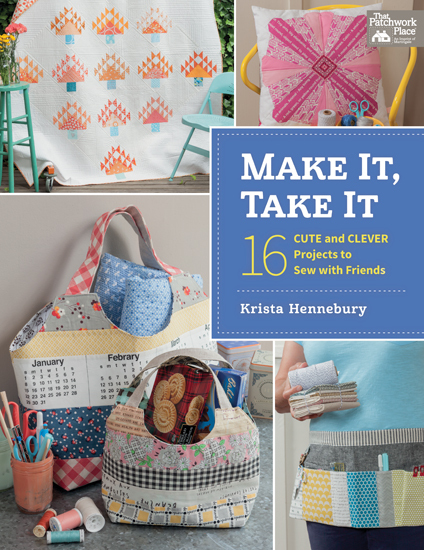 "Images from Make It, Take It, by Krista Hennebury, Martingale, 2015; used by permission. Photos by Brent Kane. All rights reserved." Went to her blog and the book sounds wonderful!